I know I have lamented about this on Facebook, so I apologize again for this little rant. So the Big One has a well child appointment coming up this week. Thankfully I put this appointment reminder on my phone because in the great state of California, the powers that be have decided that once my child turned 12 years old she is entitled to great privacy surrounding her healthcare. I can no longer see her online health information including appointment reminders, immunizations info and past lab results. Well, here’s the deal as long as the state of California is NOT paying for said child’s healthcare, they really need to keep their noses out of her perceived need for privacy. As her mother, the one who manages her healthcare, I have always had access to her medical information. So if there was a Girl Scout permission slip where I needed the dates for her immunizations, I could log into the system and quickly see all of her immunization dates. If the other moms were comparing the size of similar aged children, I could log into the system and quickly see how much the Big One weighed at her last appointment. When The Husband talked about visiting amusement parks, we could easily log in and see just how tall she was to determine exactly which rides she could go on. But now that she is 12, the state of California thinks I should not have access to this information. So back to the well child appointment that is coming up in a couple days. I have now received, via e-mail, TWO notifications regarding a health questionnaire that the physician has requested be completed before the upcoming appointment. 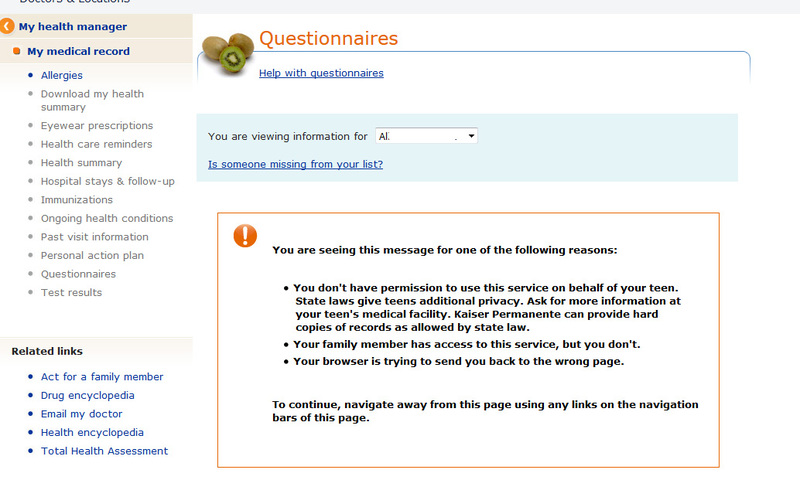 Funny thing is, I cannot access the questionnaire because again the state of California believes my child needs privacy. I know what you are thinking, this really is an easy fix. If she is old enough to deserve privacy, let her have her own online account to manage these things herself. Well, here’s the kicker, she is apparently old enough to deserve privacy, but she is NOT old enough to create her own online account. She has to be 13 to be considered responsible enough to have an online account. Someone please explain this to me. I’ve done some research on this challenge. 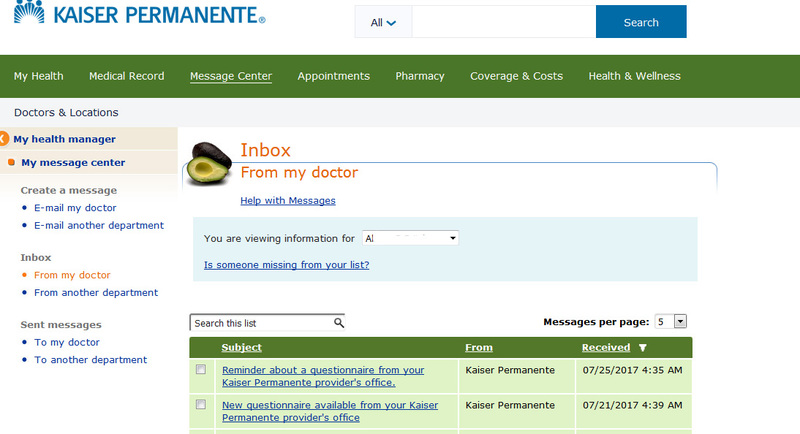 While the state of California made the laws, it seems Kaiser is also partially to blame. There are other healthcare systems in California that have special online systems for kids age 12-17 that allow individual accounts. 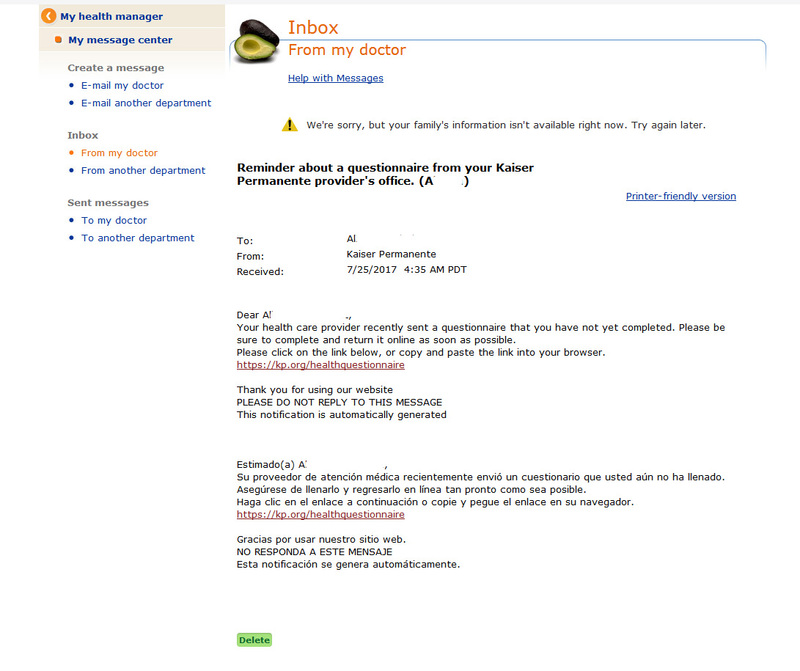 The information that Kaiser provides seems to contradict their reality. As I read this information, I should still have access to her online account until she turns 13, but that is not the reality. I guess I will be reaching out to Member Services again to figure out what’s actually going on. As an aside, my child is healthy. She doesn’t have any difficult or chronic conditions that we have to manage daily. So, yes for us this is simply a very minor inconvenience. My heart goes out to my friends and family members who children have chronic conditions that require daily medical interventions. I have heard those horror stories regarding access and cannot imagine the stress that adds to survival each day. If only we lived in a world where the powers that be truly understood the daily plight of the average citizen. I can even read the message! OOPS! Just kidding I can’t do what they are asking me to do!